One of the apps, Live Transcribe, turns live speech into real-time captions by using a phone's microphone; the other, Sound Amplifier, improves a phone's sound output. It has a type-back keyboard for users who can't or don't want to speak, and works with external microphones to improve transcription accuracy. Once on a phone, it can be activated from the Accessibility settings and launched from the Accessibility button on Android's navigation bar. Although Live Transcribe doesn't have some of the features of competing products, a big part of its appeal will be simplicity. "It doesn't have bells and whistles, but is really darn good at its core function -- to provide captions to what is spoken around you," said Christian Vogler, director of the technology access program in the department of communication studies at Gallaudet University in Washington, D.C.
"It doesn't require any setup before it is ready to go, and it is always on, available from anywhere in Android at the touch of a button," Vogler told TechNewsWorld. "Most competitors I have tried and am aware of can't do this," he explained. "They require multiple steps, more or less complex configuration, or a combination of those. By the time you're ready to use it, the moment very well may have passed." Such situations include one-to-one or small group conversations where it's difficult to lip-read or understand a speaker even with hearing devices on. "Every person with hearing loss knows situations where they just nod and smile and hope that they wouldn't get called out on their pretense of understanding. Typically, if we struggled, we would just give up," he said. "You can also use the app to get a quick idea of what people in close proximity are talking about and jump in if you so desire. Personally, that is something I never ever have been able to do before, and it is incredibly liberating," added Vogler. "For me personally, it has been a complete game changer in many ways." One of the biggest challenges to Google's app will be noise. 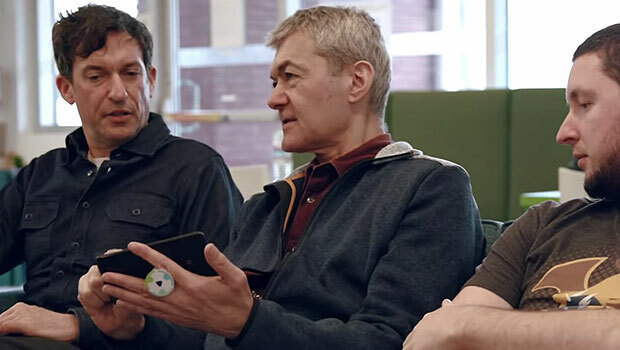 "Anything that is using speech-to-text software is going to rely on a good signal," said Tina Childress, an audiologist in Champaign, Illinois, and late deafened adult with cochlea implants. "Trying to do live transcription in a noisy restaurant is going to be more difficult than doing it in a quiet place," she told TechNewsWorld. The app needs a way to single out a person and transcribe what they're saying, and cut out all the hubub, said H. Kennedy Hudner, a retired attorney with impaired hearing who lives in Glastonbury, Connecticut. "That's called the 'Restaurant Syndrome,'" he told TechNewsWorld. "It's still the single most difficult situation for hard-of-hearing people, even when they have good hearing aids." "Whenever I try to verbally do a Gmail, it's always fascinating to see how the transcriber there completely mangles what I try to say," Hudner observed. "Speech recognition is a lot better than it used to be, but I would not want to rely on that for things like news," she said. "There are too many things that can go wrong. You need to rely on the accuracy of a live captioner." Live Transcribe doesn't work well in environments where the background noise is so loud people have to raise their voices to be heard, Vogler acknowledged. "If two people with hearing loss use it for communicating with each other, and if their voices have a 'deaf accent,' this would be a challenge," he said. Google showed it is aware of the noise problem by adding a visual indicator to Live Transcribe that displays the signal-to-noise ratio of a phone's surroundings, so an operator can gauge if the app is going to perform effectively or not. Although just released, Sound Amplifier initially was unveiled at last year's Google I/O conference, the company's annual developers forum. Sound Amplifier makes a phone's audio clearer and easier to hear. "Sound Amplifier enables an Android phone to be used as a sound booster, so you could use it to amplify speech or other sounds in your direct vicinity," noted Charles King, principal analyst at Pund-IT, a technology advisory firm in Hayward, California. "It's a bit similar to TV Ears hearing devices -- so you might use it with a pair of earbuds or headphones to increase the volume of TV or music without disturbing the people around you," he told TechNewsWorld. There's been an increase in integration between smartphones and certain devices, like hearing aids, King noted. That's usually accomplished via a Bluetooth connection that allows phone calls, music and podcasts to be streamed directly to the hearing aids, he explained. "The problem is that most hearing aids are expensive, and streaming features are typically available on high-end and high-priced products," he said. "Live Transcribe and Sound Amplifier add hearing assistance capabilities to Android phones freely, so you can't beat the price," he observed. "More broadly speaking, the apps provide valuable access to disabled people and communities. That's frankly an area that most IT vendors fail to put much investment or effort into," King noted. "Google deserves kudos for these apps in that regard."